On the hunt for a handcrafted and stylish symbol of your eternal love? Welcome to our huge list of cool men’s wedding band ideas. We’ve burned the midnight oil to research and select a number of rings we think you’ll really enjoy. 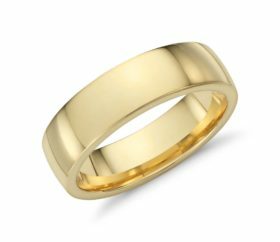 One massive list to highlight some of the most unique men’s wedding rings on the internet, broken down by material type to make it easier to browse. Dear brides: please don’t hate ​us too much for suggesting this amazing basketball themed ring design. ​We understand that not everyone enjoys sports — one half of L&L is included in that category! However, chances are your future spouse has a secret or not-so-secret obsession with football, basketball, baseball, or even cricket (yup, that’s a real sport too)! The design of this basketball themed gold wedding band has a classic appeal. Andew could especially see ​himself wearing the basketball ring. Of course, the fact that he’s watched NBA games for over 25 years could have something to do with it! Definitely consider this a #1 draft pick for your man’s wedding ring! 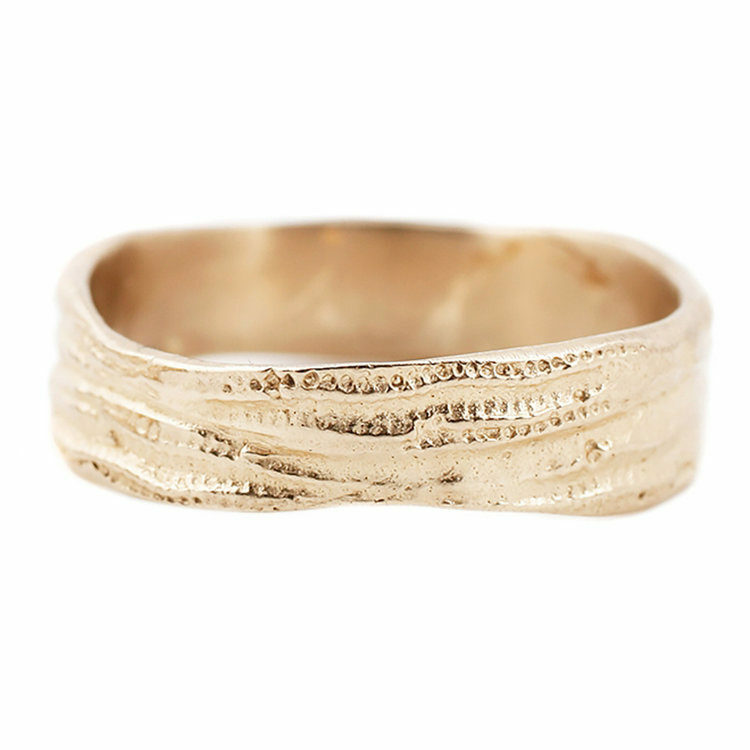 Earthy, rugged, and made from 14k yellow gold, this ring’s appeal is its textured design and non-symmetrical look. 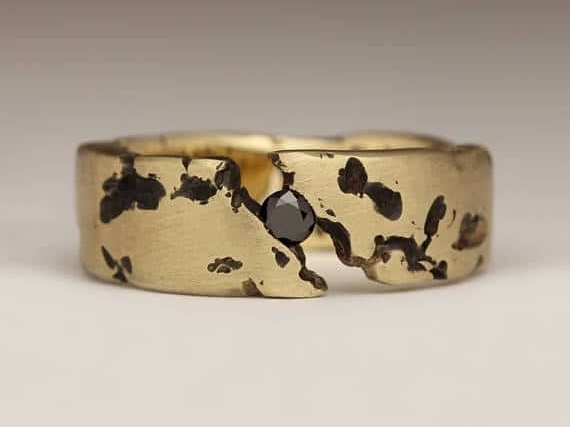 I see how the designer was inspired by ‘the eternal heat of Mojave Desert’ to forge this unique wedding band. 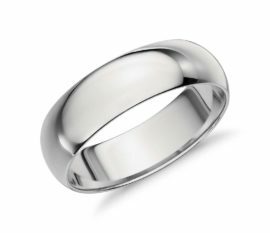 A brushed finished ring with polished edges, this wedding band offers the wearer a sleek design at a great value. 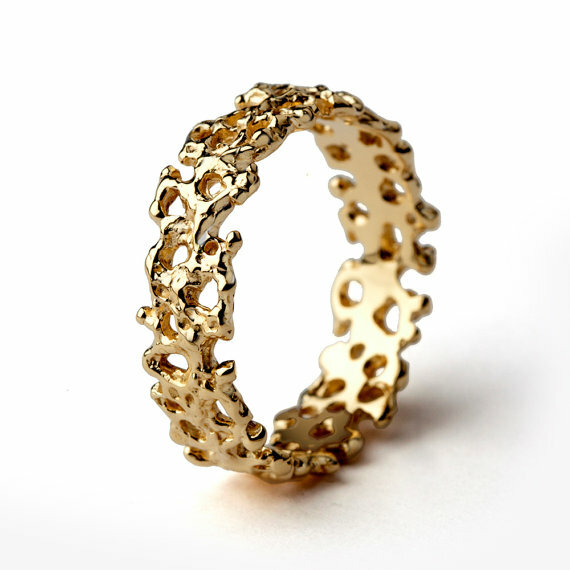 This ring has a boho-beach feel to it, which could be why Lauren Wolf chose to name it ‘Gold Urchin’. 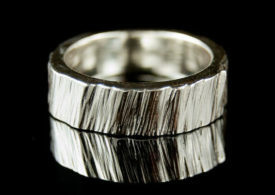 The ruggedness of the ring is evident and should appeal to a ring buyer with a love for unique jewelry. 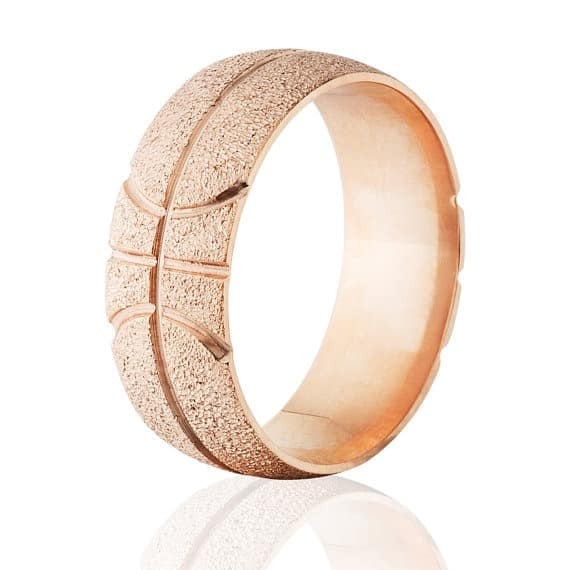 As a followup to our sea themed gold bands, we’re featuring this irregular coral design 18k gold wedding band from 5-star Etsy seller Arosha, based in Israel. 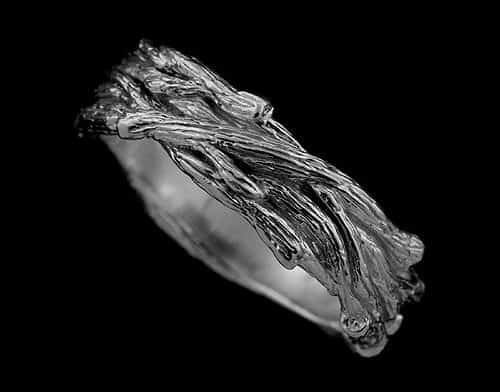 ​Made to resemble a twig or bark from a tree, this ring is anything but ordinary. 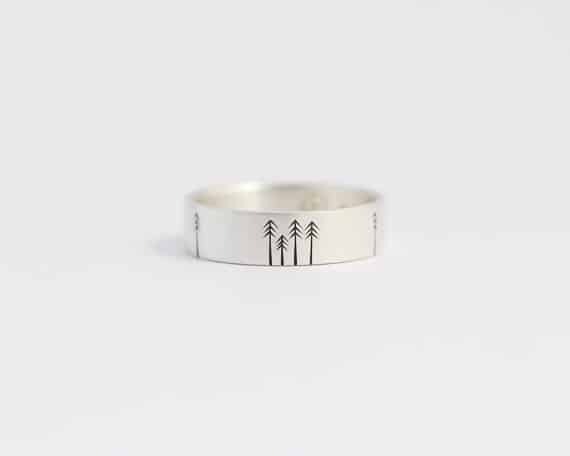 A nature inspired wedding band that is made to order by a young Canadian artist. Doron Merav is a talented Israeli designer whose ring styles speak for themselves. 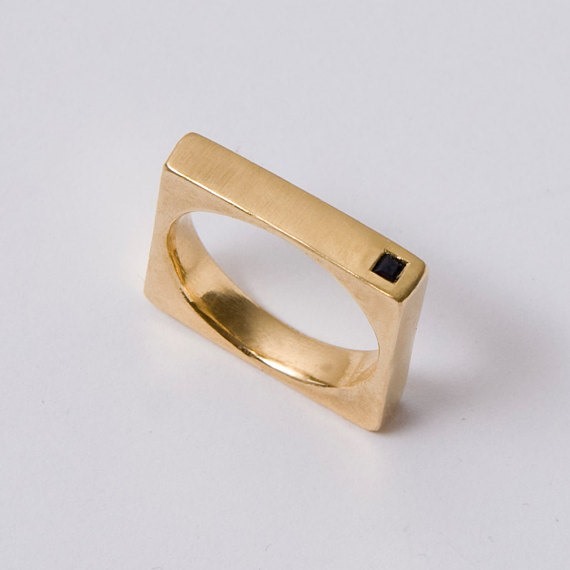 Why re-invent the wheel when you can have the unique shape of a square ring with onyx inset! 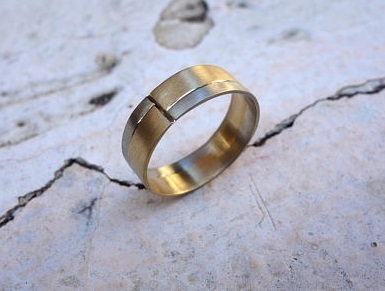 A unique handmade gold band using an interesting mix of metals, integrating a beautiful matte finish design. 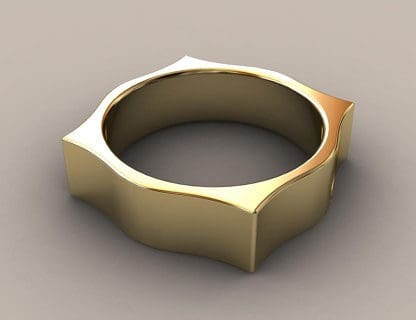 If this ring peaks your interest, definitely check out the other products that JKASHI1889 has created. There are all sorts of unique and wonderful pieces. Classic Christmas jokes aside, I love the unique look from New Jersey based artist Angelo. The term karat is a unit of measurement used to measure the purity of gold. Basically, the higher the karat the more pure the gold. Similar to a diamond, the higher the Karat, the more dollar signs on the price tag. 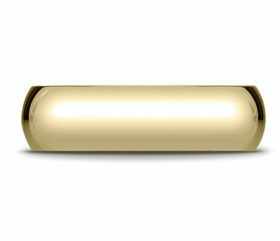 For example, 24 karat (also referred to as 24k) is known as pure gold. However, 24k gold likely won’t adorn your ring finger. In its pure state gold is pliable and very soft, and is generally considered unsuitable for jewelry such as wedding bands. 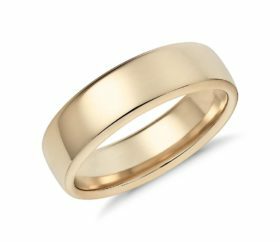 What’s so great about gold for my wedding band? Which gold karat should you choose? From the question above you know that 24k gold is not really suitable for your wedding band. Which gold karat should you choose? Well, there are 3 different karat gold combinations which have become the standard for wedding bands: 18K, 14K, and 10K. Contains 25% alloy and 75% gold; have a brighter yellow tone. Contains 41.7% alloy 58.3% gold; have a darker yellow-orange tone. Contains 58.3% alloy and 41.7% gold; paler in color with a less yellow tone. In short, in order to make gold jewelry that’s long lasting and durable, gold is mixed with other metals called alloys. These alloys make the gold stronger and even change it’s color if desired. The alloy may add strength, but it will also diminish the value and may even cause allergic reactions and/or tarnish. In order to try and achieve the best balance between the desirable and valuable properties of gold (including strength) the three standard gold combinations were created. All three of the gold karats are available in yellow, white, and rose gold. Typically, white gold alloys are stronger than yellow gold alloys, so a white gold ring will be slightly stronger and last a little longer than a yellow gold ring. 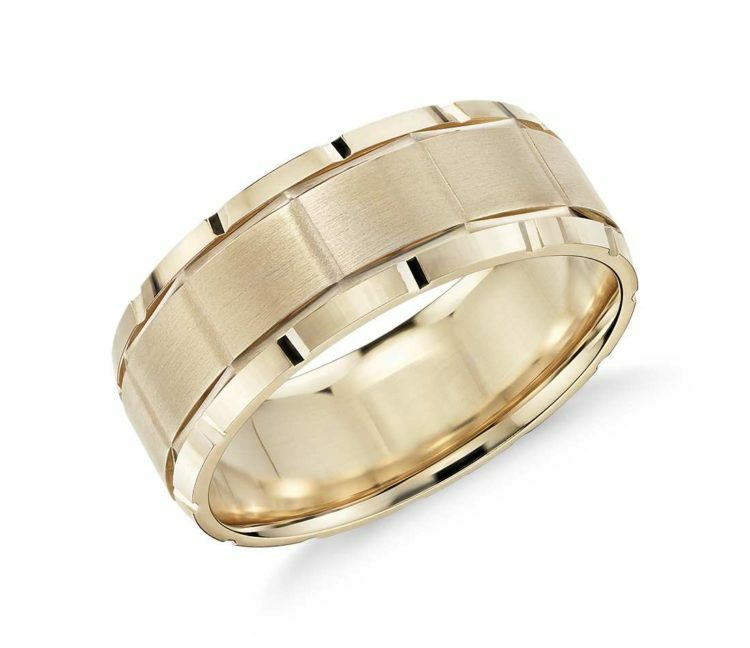 With all the different options for men’s gold wedding bands available, make sure to choose the right karat grade to fit your budget, style, design and color — the possibilities of this wonderful metal are truly endless! A 10k gold ring is the most affordable wedding band because it has the least amount of gold content. At the opposite end of the spectrum, an 18k gold ring is considered the most posh and expensive. 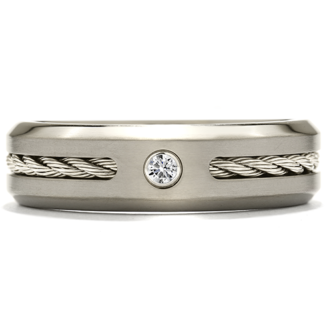 For a mid-range wedding band, stick with a 14k gold band that combines a balance of good quality and price. Gold has been prized for millennia by ancient and modern day civilizations alike as a symbol of prestige, luxury, and wealth. Furthermore, the rarity of gold along with its aesthetic qualities make it an ideal material as a symbol of immortality and power. Yellow gold is often considered to be the most traditional metal for a man’s wedding band, offering a timeless and classic look. 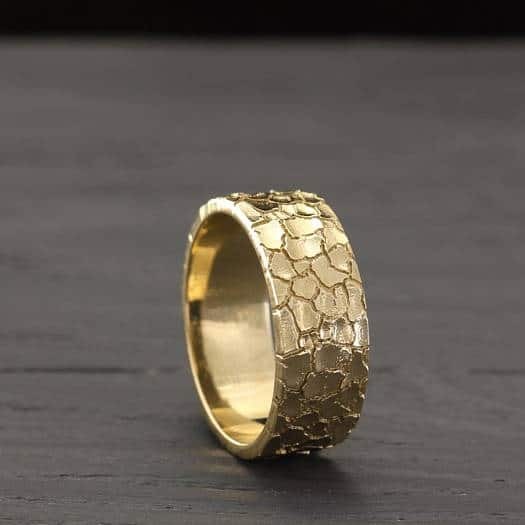 Gold is malleable and softer than many other types of metals, which makes it easier to fashion a wide selection of gold rings for grooms to choose from. Man’s best fashion friend is black. Think tuxedo, black tie, and a black leather belt. Your ensemble is complete thanks to this enduring 14k white gold wedding band, showcasing striking channel-set black diamonds! 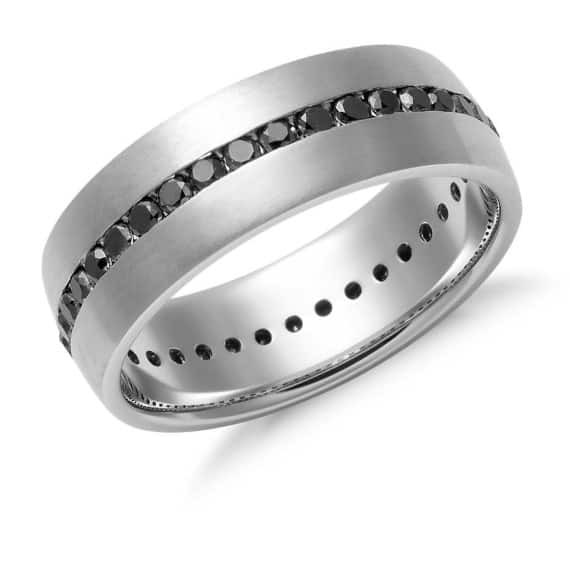 A luxury diamond jewelry house that specializes in creating handcrafted diamond engagement rings in West Hollywood presents this stunning handcrafted men’s wedding band design in black rhodium with black pavé diamonds. 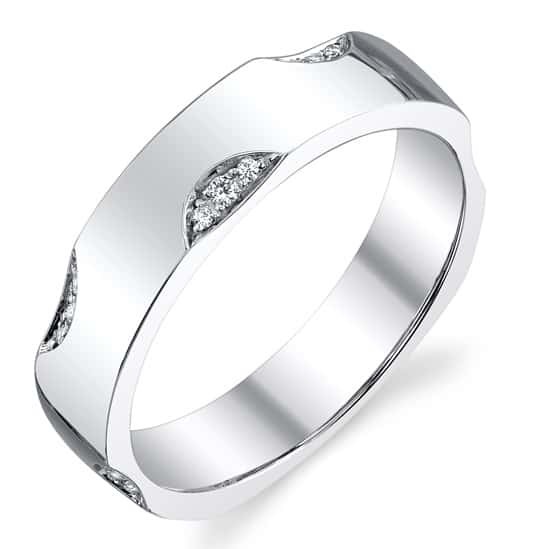 A ring with a high polish finish, we love the ultra sleek look of this ring design! 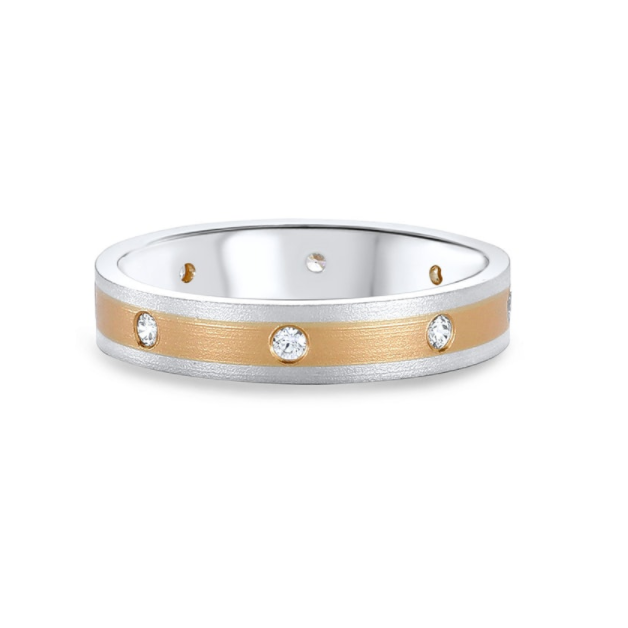 The slim profile of this 18kt white and yellow gold band with diamonds really appeals to me. Wonderful design from a trusted online jewelry store (Ritani). High marks for this beautiful platinum 6mm diamond eternity band featuring a polished horizontal center trim between rows of three round cut stones. Maybe not that practical for a ‘forever ring’, but then again to each their own. 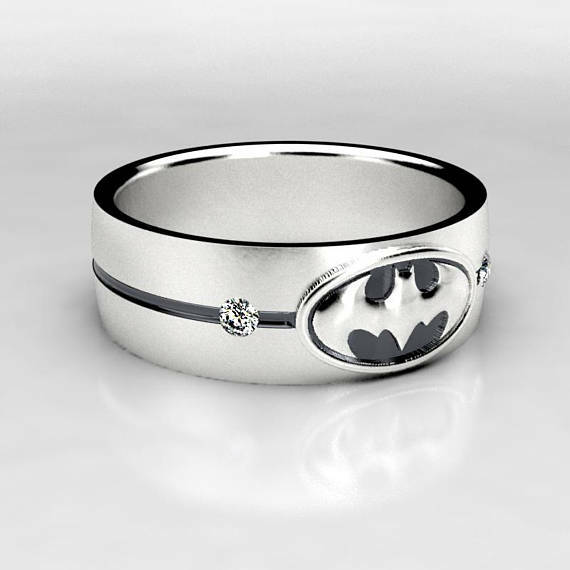 If you’re going for a superhero themed wedding (styled), might as well go all out and purchase a superhero ring too! How about a Zelda ring? Any guy that loves his video games (1980/90s classic The Legend of Zelda anyone!?) 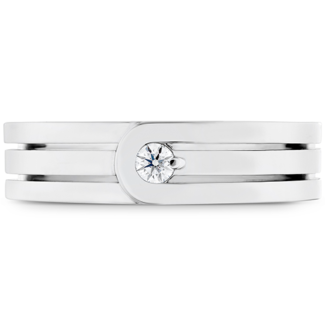 will appreciate this striking 2mm blue diamond designed ring. Loving the overall look of this ring, square and all! 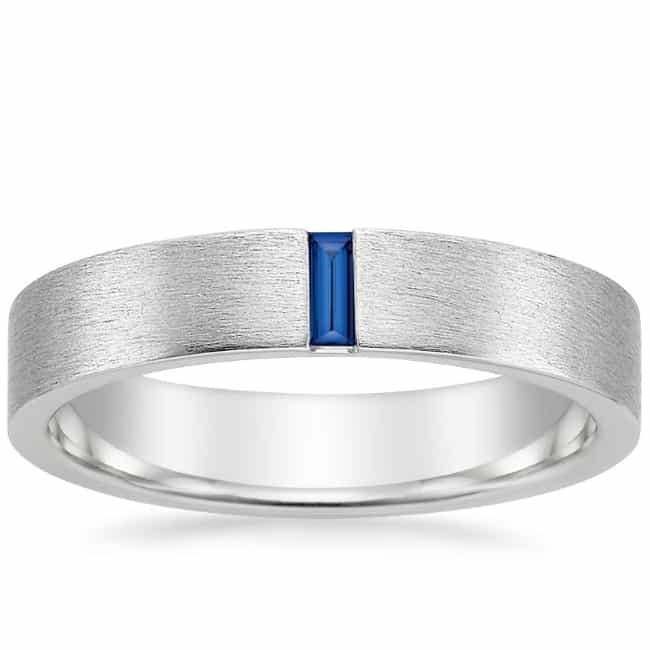 One of Brilliant Earth’s top 20 bands, the minimalist style of this wedding band with its’ vertical sapphire baguette is what sets it apart from the rest. Complete with a matte brushed finish, this ring may be simple, but it definitely has a presence about it. Anytime you hear the words ‘sandblast finish’, you’ve likely got his attention. 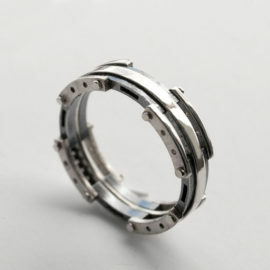 This is a beefy 8mm wide ring produced by designers in Montreal, Canada. How that diamond doesn’t pop right out — I don’t know! The design is certainly unique and one that caught our eye. The overlapping band creates an intriguing diamond clasp design. Another beauty from Hearts on Fire. 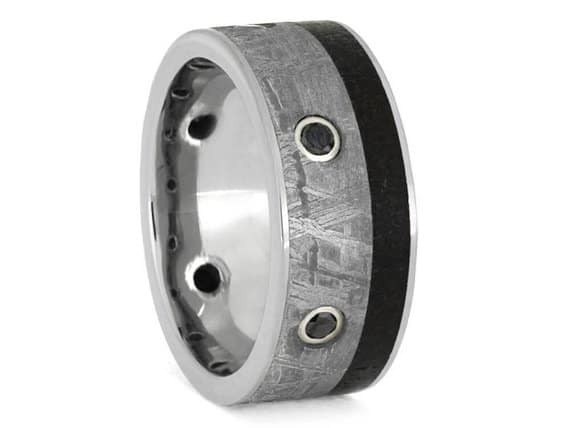 Guys who really love integrating industrial materials into jewelry will appreciate this super unique ring. An ethereal, earthy feel like something that should emerge from a cave in the Lord of the Rings. The black diamond set in a textured diagonal crack is as unique as they come. 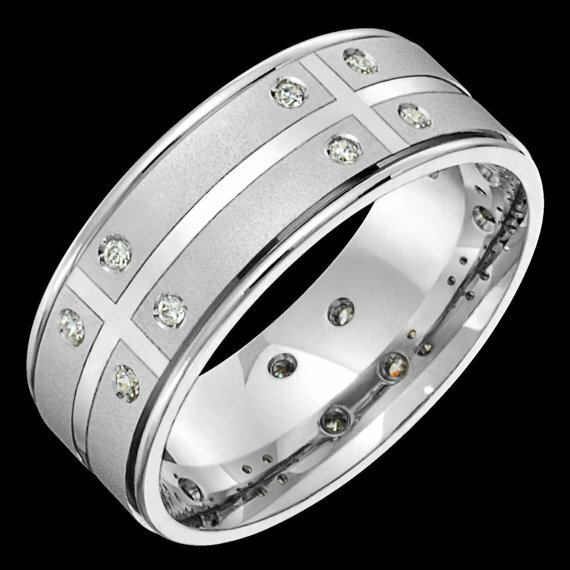 It doesn’t get much better than this for an epic ring for your man, lovin it! 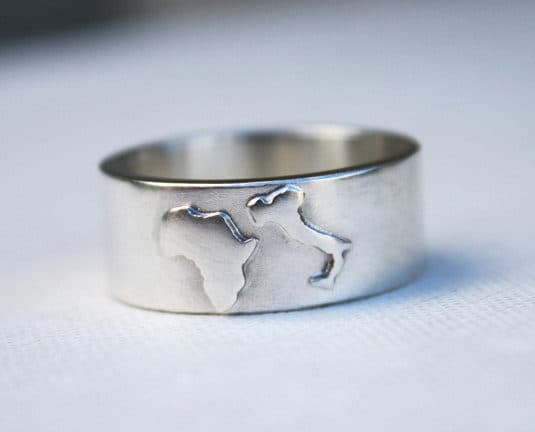 If traveling is your thing and you want to show off a special place, customize your future husband’s ring with a unique map. Add up to two different countries that mean something special to both of you: where you met, where the proposal took place, or even where you plan to move as a married couple. 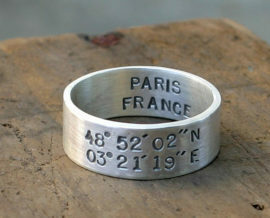 Alternatively, a California designer can provide a unique ring that engraves the exact latitude and longitude ​of a special locationn — like where you got married! 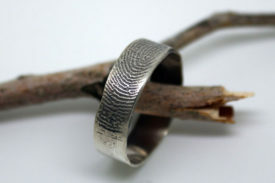 What better way to express your love then putting your fingerprint on his ring? Gals get to look down at their diamond ring all the time and reminisce. 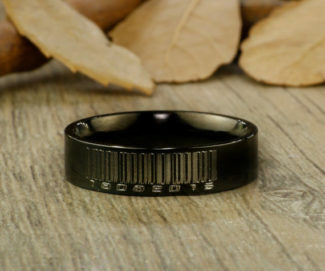 Give him something to adore by adding your finger print to his ring. You can’t get any more unique or eye catching than this ring. 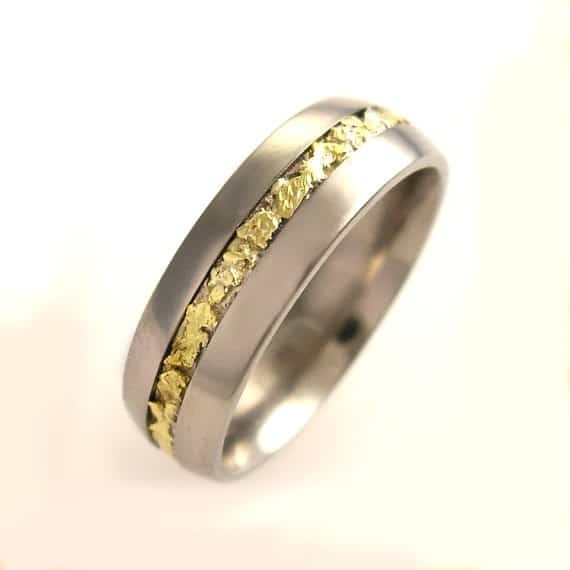 Made from solid sterling silver and random drops of 18K yellow gold, the contrast of the oxidization and blue metal staining will even have your wedding guests sitting in the back row wanting to get a closer look. 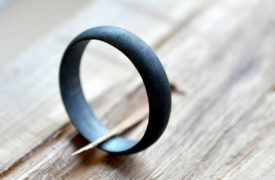 ​An Australian designer presents this ring made from brushed and oxidized sterling silver in a black-grey finish. Over time the ring will weather and the pattern will be unique to you. 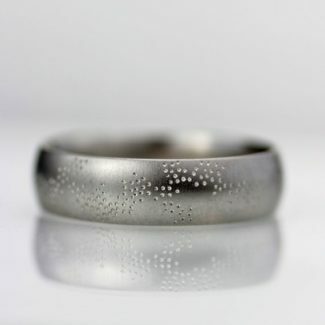 A unique and speckled texture ring. 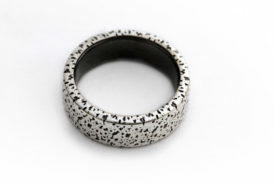 Dalmatian dog lovers may need to buy two of these rings just because! Can’t decide if you should buy him a gold or silver wedding band? 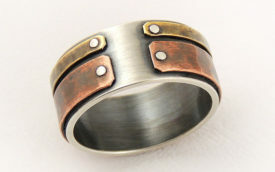 Then get the best of both metals with this ring. 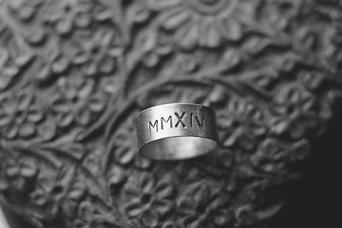 I always forget if ‘X’ is 10 or 50 … but I’m sure you’ll be able to remember your special day by having it written in roman numerals on the ring itself. ​Oh My! 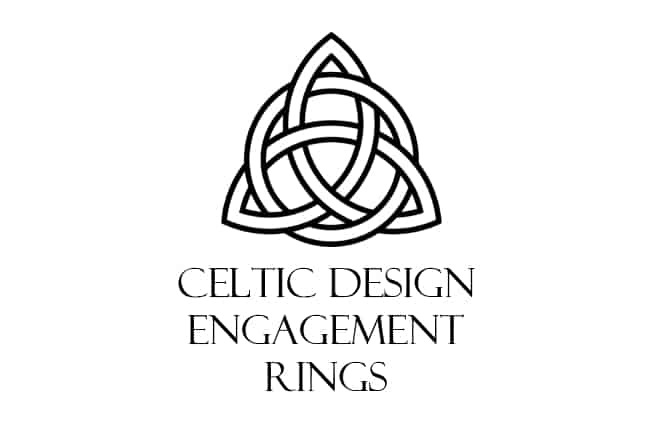 A unique handcrafted ring made from three metals that will find a worthy finger for any Game of Thrones fan or lover of medieval wares. I am totally into this ring! 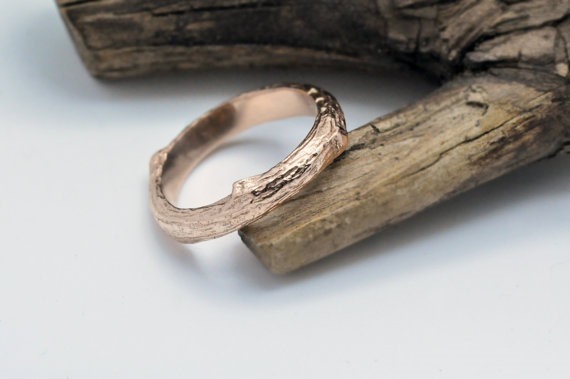 A handcrafted ring inspired by the German wedding tradition of log cutting. Need we say more? ​Similar to the gold version above, this unique ring is a sterling silver organic design made in New York. 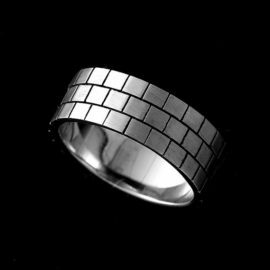 Pure silver is in fact too soft of a material to be used for a wedding band. 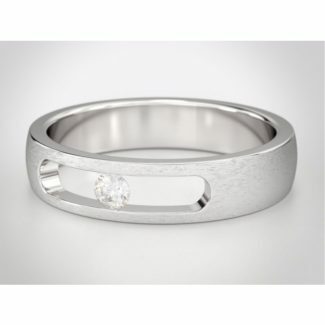 What you will come across when searching for a “silver wedding ring” is sterling silver. That means a .925 hallmark stamp on the inside of the ring. Sterling silver is 7.5% copper alloyed with 92.5% silver (by weight). No other metal has a natural brilliance and radiance than that of sterling silver. 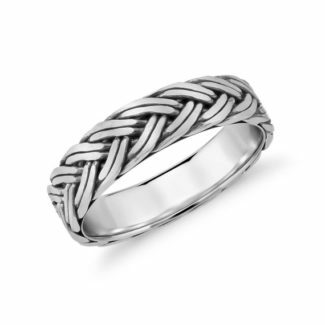 Compared to platinum or white gold, sterling silver rings are much more affordable. It is a malleable metal, which makes it a favorite choice among jewelers as design options are endless! What does ‘flashing’ mean in silver? The term ‘flashing’ has a naughty connotation. 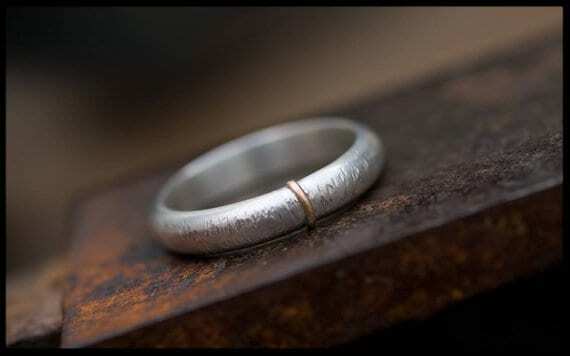 For wedding bands, you may come across silver rings that are treated with a process called flashing: the ring is plated with a thin coat of 99.999% pure silver to give it some extra shine along with a luster finish. This thin layer of pure silver will wear off fairly rapidly with everyday wear. 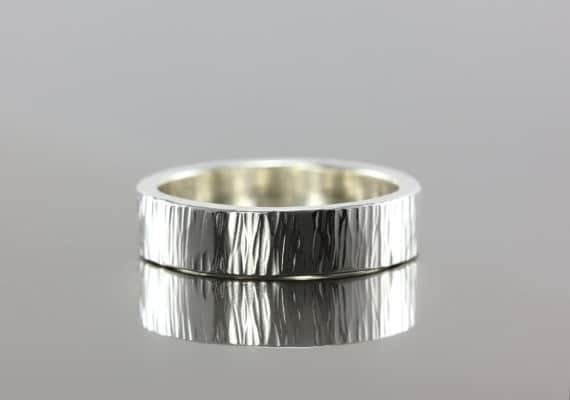 Another option is to treat sterling silver rings with rhodium plate (just like white gold bands), which will increase the shine and durability. As with flashing, the rhodium will wear off over time and the wearer will need to have the ring re-plated. Get yourself a platinum wedding band and you’ll be in good company – platinum was originally developed in the late 1770’s for royalty. There is something about these two rings that I really enjoy. Like laying the foundation of a house, the platinum ring on the left embodies the foundation and building blocks of your union as a couple. Such is the power of a braid. I confess: when I first added this men’s wedding band to the list, I had to go search the name ‘Colin Cowie’. Wedding personalities aren’t my thing, but i do really like his platinum designed men’s ring! Simple designs can produce stunningly unique results. Love the wavy shimmer of this platinum ring. The metal is finely textured by hand and the whole ring is polished to a high shine. Platinum rings were originally developed in the late 1770’s for royalty, and to this day they are still associated with high durability. They have a bright white-silver finish and give off a luxury timeless look. Platinum is a high density precious metal that is very rare, and is also one of the heaviest metals used for wedding bands. Its malleable nature makes it perfect for wedding rings settings that require intricate filigree work. However, as like most precious metals, platinum is mixed with other metals, like cobalt, iridium or ruthenium to make it harder. Yup, that’s right. 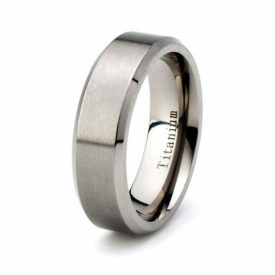 Elk antlers and sound waves made it onto our top list of titanium wedding bands. 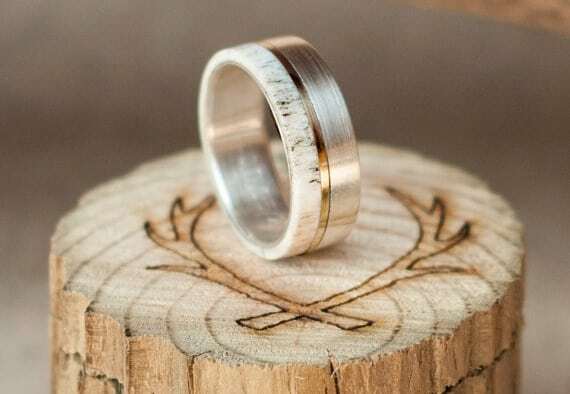 I seriously love the simple design and natural materials used in this elk antler ring. 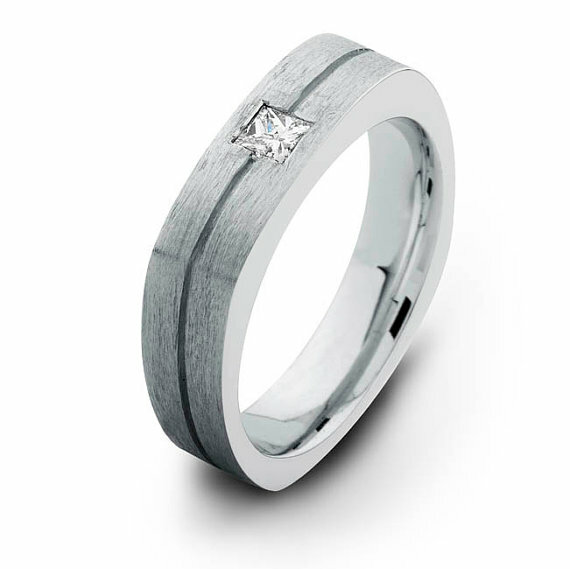 The 10k gold inlay and hand-turned titanium wedding band means you have a truly stunning piece of jewelry to wear. 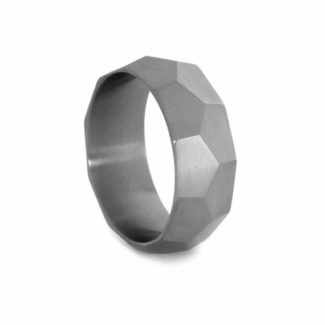 On the flip side, a little bit of sound technology is required in order to forge this unique-as-your-voice titanium wedding band. 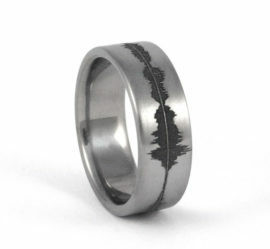 I wonder what a soundwave ring for Mariah Carey’s voice would look like!? 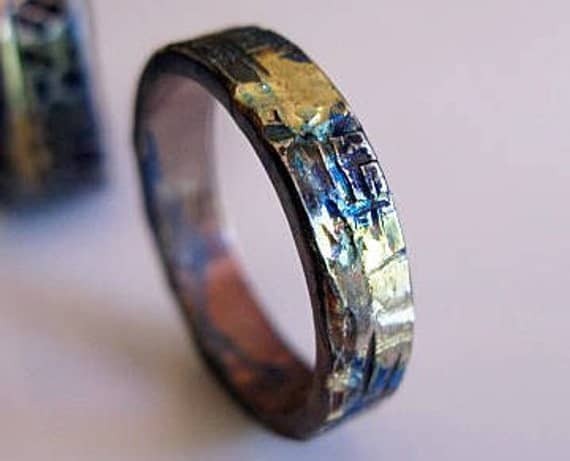 ​I would never have thought to put gold nuggets inlay into a titanium ring. I suppose that is why the talented Doug Peterson from Utah is the designer and I am not. 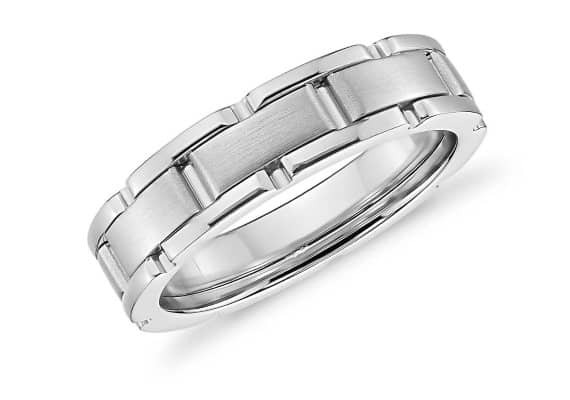 Wonderful ​men’s wedding band! If a ﻿﻿pine tree ring sells online and no one is around to hear it, does it make a cash register ​sound? We’ll leave that philosophical debate to you — we just really like this ring design. Talented husband and wife team (we love to support spouses who work side-by-side!) from Boston. 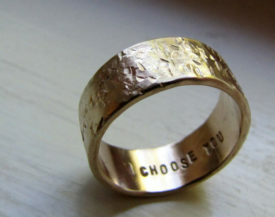 With over 1600 positive reviews on Etsy, their ring designs and service speak for themselves. ​Look closely at this ring and you’ll see a magical world of shimmering color and fantasy. The aptly named ‘Saturn’ ring is certainly worthy of an out-of-this-world unique ranking on our list. While the look is certainly unique, I have a feeling that this is one of those rings that you must physically touch and inspect in order to truly appreciate. Titanium is a metallic element that can be found in abundance and therefore is made into many different products like golf clubs, air crafts, watches and even wedding bands. Found in the late 18th century, and fittingly named after the mythical Greek giants, the Titans, who personified different forces of nature and also ruled the earth. Titanium is one of the transitional elements on the periodic table and can be found found in many forms. Titanium is a lightweight, affordable metal, that has grown in popularity for grooms-to-be because it offers a luxurious appearance, as well as a high degree of strength. Bands can be found in very light grey/white color and their actual finish can change through different methods of polishing and or brushing. An important feature to note is titanium’s strength-to-weight ratio. It is the highest out of all the transitional metals, which means that titanium is light weight, with a low density, but is extremely strong. So, if you are looking for a light weight ring that you won’t feel while wearing, than titanium bands are the one to choose. Titanium can be split into four grades: 1 through 4. Grade one is the softest form of titanium while grade 4 is the hardest. 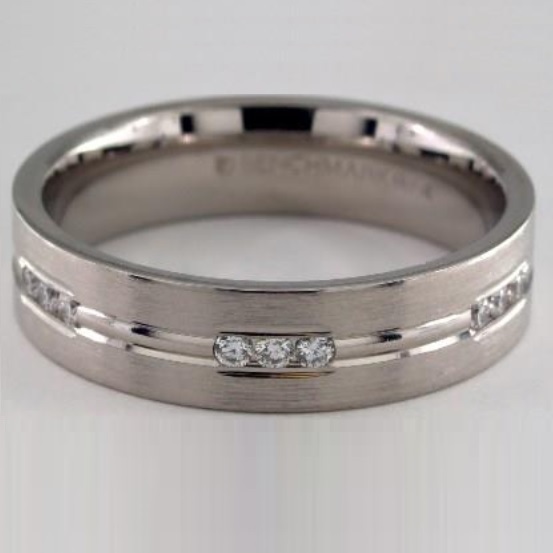 The best type of titanium for wedding bands is Commercially Pure (CP) grade titanium, which is 99% pure. Grades between 2 to 4 CP work best for rings. 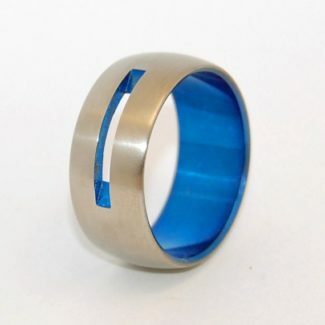 While there are many sharp looking black titanium rings on the market, the problem lies in that many of these bands aren’t actually created through the treatment process which transforms the entire color of the band. Most of them have only been plated (will eventually wear away) or have had an ion treatment that is more durable than being plated, but will eventually wear away or chip as well. 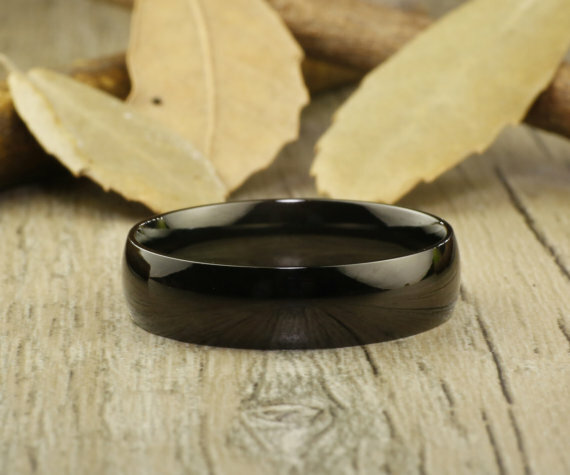 If you have your heart set on buying a black titanium ring, keep in mind that real black titanium rings will ALWAYS involve a treatment of the entire metal. If there are any notes about coating or techniques of ions, heat, or glue, than the ring has probably been coated. Titanium is naturally a grayish white color. 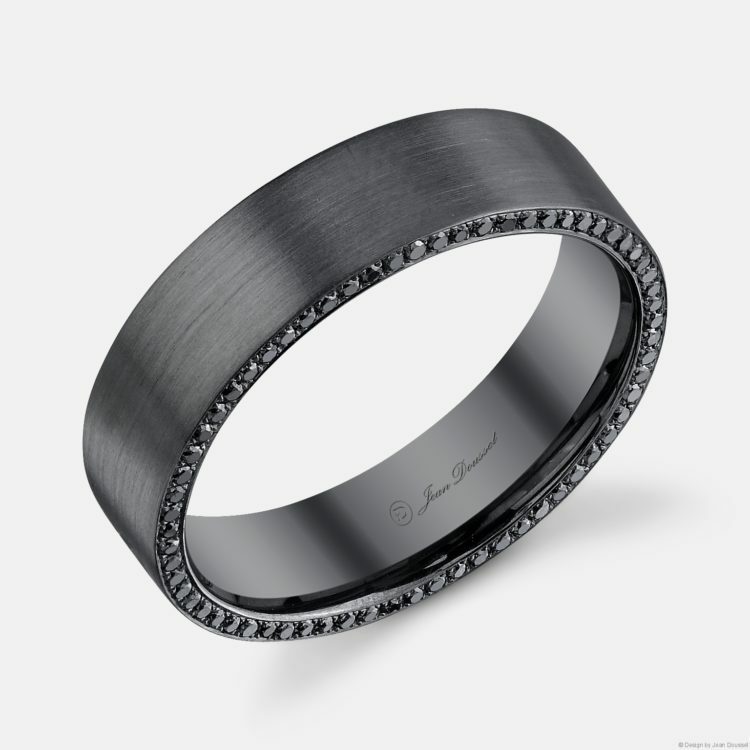 To achieve the sharp looking black titanium wedding band, the titanium is treated one of two ways: by either applying black plate or by transforming the color of the metal with silicon dioxide and heat. As for the rings being treated with black plate, they may have been through a number of processes including heat/glue treatments and ion applications. 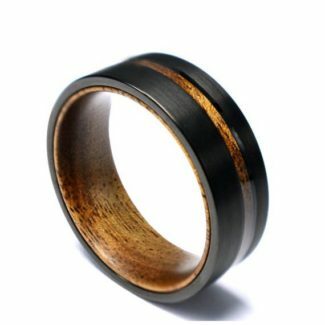 A jeweler from Virginia makes these striking koa wood and brushed black titanium rings. This comes as a wedding band set for him and her. While the look is certainly unique, I have a feeling that the polished ring look ​appeals to a select couple. 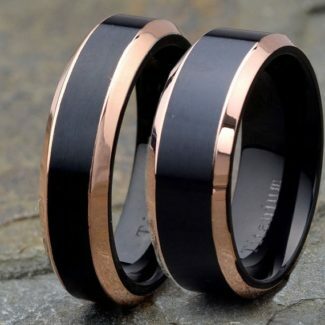 Q: Why this list of unique wedding bands for men? Q: What makes a guy’s wedding band unique? That’s a tough question to answer. One person may think something is unique, while someone else does not. In order to define unique, one must first see what is not common. Jewelry design and appeal has changed over the years. Look around at today’s newlywed grooms and see what rings they have on their fingers. Chances are the ring is a simple, solid gold or white gold band without embellishments. Then, take a look at some of the rings here and tell us if you agree that they are unique enough! Q: Can I find wedding rings for women here? Nope, this page is just for the guys. Check out this curated article we made if you need ideas for ladies wedding rings. We update this page as often as ​we can. However, you should always check the retailer’s website for accurate and up-to-date prices. The prices listed on this page are an indication only (where applicable) . Custom rings may be more or less expensive than the prices we indicate on this page. Q: How do I buy a ring online? 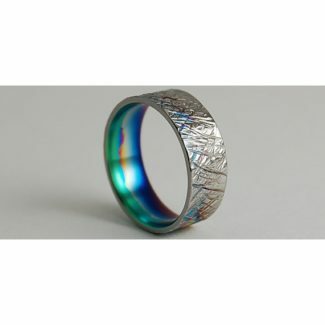 This page lists the weird, wacky, and wonderfully unique men’s wedding bands that we love! 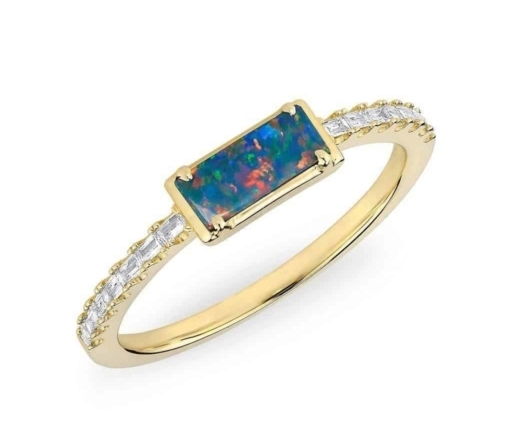 If you decide to click on a link and buy a lovely ring via this page, we may earn an affiliate commission at no extra charge to you. Unless otherwise stated, all rings on this page are sold through independent artists or companies. Please read their respective policies regarding purchase, ordering, or customer service for further instructions. Final Note: If one of the wedding rings ​really speaks to you, don’t wait too long to decide. 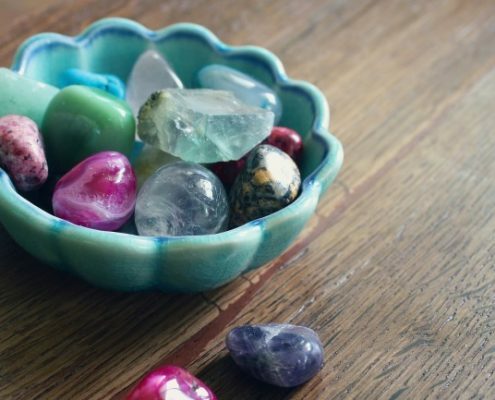 It may be a one-of-a-kind item and could sell out! This is really wonderful collections, I hope everybody likes this post and unique collections also, thanks for sharing. These wedding bands are excellent. I love the style and they all have a combination of modern and classic touch. 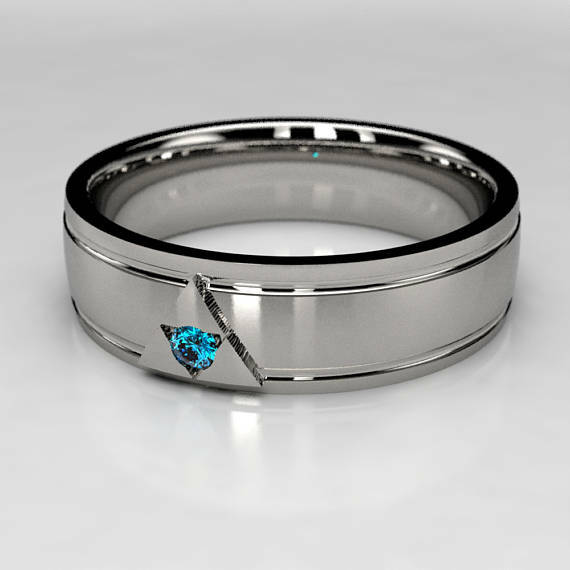 Me and my fiance have already ordered our wedding rings and we cannot wait to put it on our wedding day. These are also some great ideas to check out.